HomeBooks by AgeAges 0-3What’s in Your Library Bag? Classic or New Picture Books? What’s in Your Library Bag? Classic or New Picture Books? I’ll tell you what’s in mine if you tell me what’s in yours? Going to the library is such an exciting trip for me. I get so excited about being surrounded by so many excellent books, and the thought of being able to take home 50 at a time is just WAY too much for me to handle. My husband often has to remind me that my daughter is doing a much better job at containing herself than I am. Thankfully I haven’t been given any “shh looks” by the librarians, but I am sure it’s only a matter of time. My daughter’s picks were based on her fascinations of the week — Cinderella and witches. Translated and illustrated by Marcia Brown. I am no expert on Cinderella, besides watching the Disney version umpteen times as a child, but what I can tell you about this book is that it has very classic beauty. 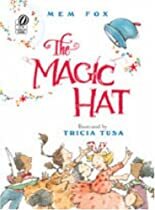 I believe it won the 1955 Caldecott Medal. It is a translation from the French version by Charles Perrault, which is apparently a favorite amongst story-tellers. I quite enjoyed this oldie from 1964. It’s about a nasty old witch who breeds nasty black witch cats, but when one of the cats is born yellow — and even worse, nice — the witch is not happy. The good news is the nasty witch is sweetened by the cat. Although, by the time it takes her to become nice it could have pre-schoolers and kindergartners feeling a bit unsettled. A good choice for first and second graders. has been a huge hit! It gets a child approved gold star! A page-turning, belly laughing, picture book that everyone should read. Mem Fox is an Aussie favorite of mine. You may know her from her latest book, Ten Little Fingers and Ten Little Toes, or one of her oldies, like Possum Magic. Parents Thumbs-up award! 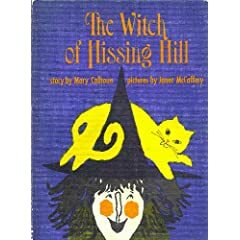 This post brought a smile to my face, because I recall The Witch of Hissing Hill from my own childhood. The yellow cat is such a great visual on that blue and black cover. I think I still have the book around here somewhere. Perhaps I’ll go unearth it for a re-read. It’s always nice to know you helped someone smile!! Enjoy re-reading it. We have a copy of Cross Country Cat which I have just discovered is by the same author, Mary Calhoun. The copy is from my husbands childhood – he grew up in Steamboat Springs, CO, which is where she is from. I think it may even be a signed copy. I’ll have to do some unearthing, too.